Written by Fred Bruenjes, Ramona, CA. Scroll right if you can't see the text at the right edge of the screen. On Sunday October 26, 2003 we received a phone call at 1:44AM PST. It was our neighbor warning us that a wildfire was moving our way fast. 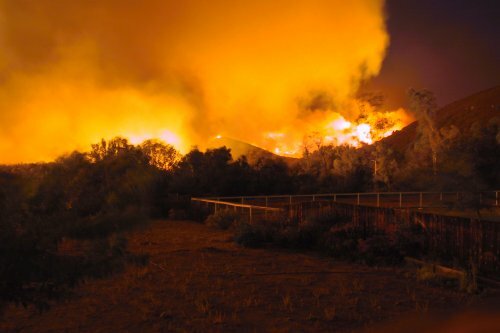 We didn't know it at the time, but it would become the largest wildfire in California history. This is what the fire looks like from a distance, seen here from the Village Store parking lot. As we frantically packed our most sentimental and important belongings, the fire turned night into day. The fire crested the nearby Indian Head Mountain and was slowing eating its way toward us. 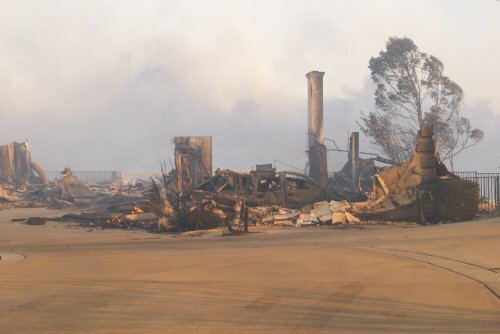 The powerful Santa Ana winds were blowing out of the northeast at 30-35mph, pushing the fire at breakneck speed. 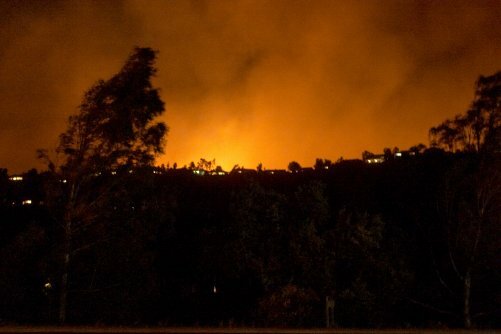 Around 5AM the fire had come over the last ridge and was lapping at our neighbor's property line. One of his trees caught fire. This is where we did something very stupid: we decided to stay and fight the fire. Folks, if you're ever in this situation just pack up and RUN. Don't follow our example! 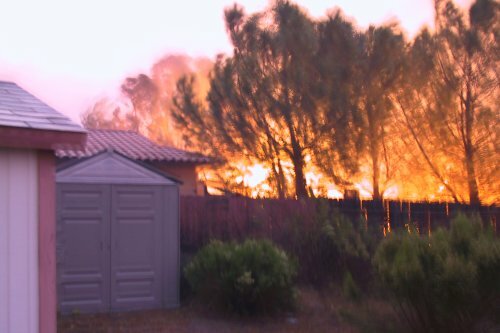 We wetted down the bushes and outbuildings furiously, and doused embers and small bushes whenever the fire tried to cross our fence. Having already burned the ridge just past the creek at our property line, the fire was now burning the brush on our side of the creek. A fire crew pulled into our neighbor's driveway and set several backfires, which definitely helped. Futility or Perserverance? Here Horst soaks a bush that caught fire, just yards from a wall of flame. Had the wind shifted even slightly the outcome would have been tragic. DO NOT TRY THIS AT HOME! 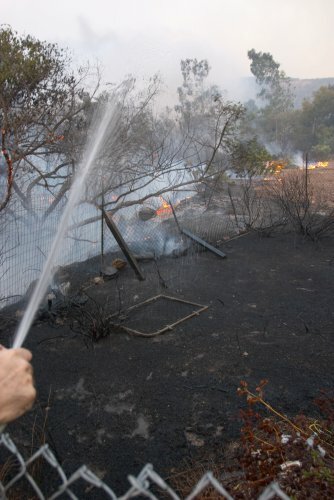 Amazingly the garden hoses and firefighter's backfires worked. 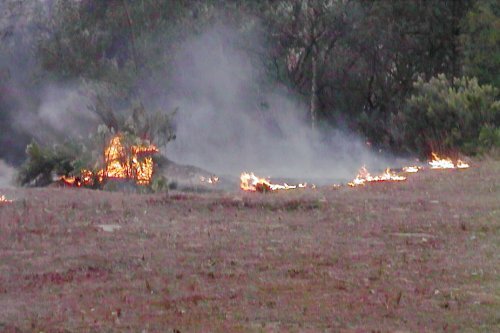 The fire moved on, barely crossing onto our property. Here the large flareup at right was caused when a large old earthmover tire caught fire. The worst-hit part of our yard was an unused old dog kennel. It was empty except for the old garden gate. The no-man's land between our property and the Barona Indian Reservation was devastated. Once the smoke clears I'll try to post a photo or two showing the moonscape. We spent all day Sunday putting out the hotspots. We had a particularly nasty underground fire, where mulch was burning in between the fill rocks. 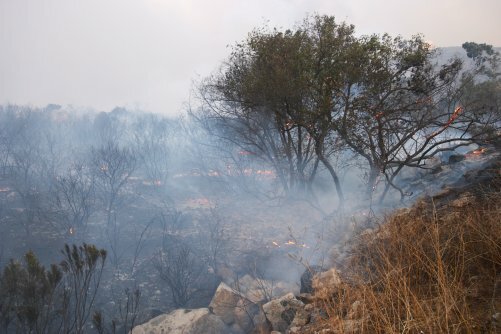 The fire didn't give up, it continued creeping along ground towards our houses. The neighbor and firefighters doused these small flames before they could do any damage. 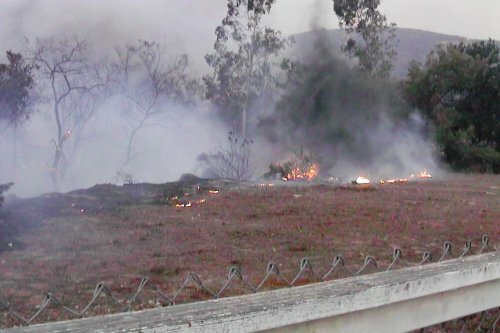 The tire (large lump at left behind bush) was still burning hours later. It took our neighbor a lot of work to put out. The fire also had knocked out almost all of our services when it burned through other areas. 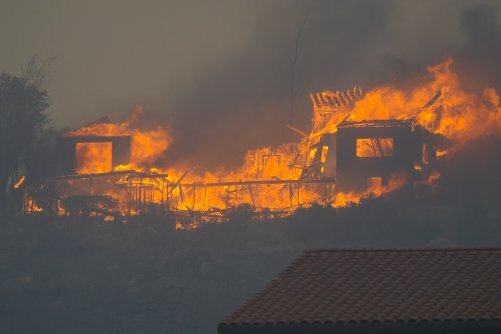 For several hours on Sunday, we had no power, no landline phone, no cellular phone coverage, no cable TV, all the roads were closed, and the fire was lapping at the water tower and the sewage treatment plant. Yikes! Just up the street on Moonglow Court they weren't as lucky. We believe this house caught fire when a flying ember hit a wooden deck. I am now of the opinion that wooden shake-shingle roofs MUST be outlawed, they are simply too dangerous. Around the corner from us on La Plata Court, there was complete devastation as many of the houses around the court were levelled (I counted about five). This one was the most recognizable, notice the car in the garage. 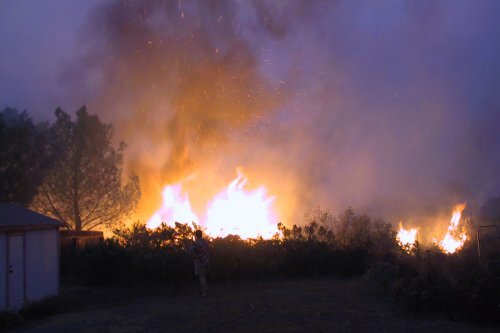 We were threatened again on Sunday night, when the fire hooked around and burned the land near the water tower to the west and northwest. There was a fire crew attacking it, but the puny water hose was little match for those flames. We had to suffer through another sleepless night, this time worrying about what may come. 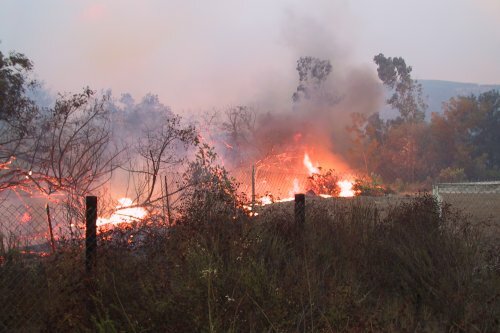 Thankfully the winds died and the fire fizzled out in the wee hours of Monday morning. 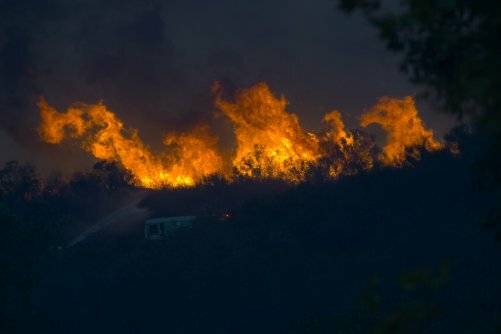 The threat of fire continued for several days. As late as Wednesday evening we were put under an "advisory to prepare for possible evacuation due to shifting winds". 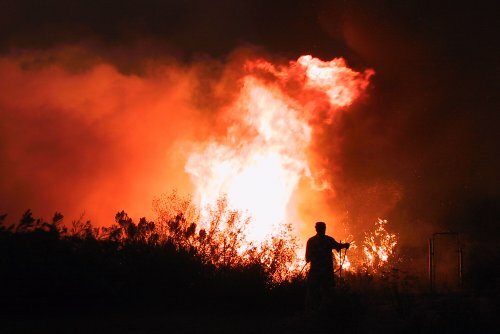 As I write this Thursday night the 30th, the fire is still raging in the Julian area. I hope it will be put out completely very soon. Unless otherwise noted, all text and images are © 2003 Manfred Bruenjes - All Rights Reserved. Image inlining and framing are strictly prohibited. Email for permission before using an image or text.